We are very near to the return of Jesus to collect his Church. It is easy to identify and to watch the events that lead up to Jesus’ return. As Turkey and their allies move nearer and nearer to Israel we can know that Jesus is on his way. Jesus will return to cause the Turkish led forces in the Golan Heights to retreat! Turkey is in northwestern Syria now. Turkey will attack Hamah and Tell Rifaat first (Jer 49:23-27). Turkish President Erdogan said that the Turkish Army could attack at any moment. Then Turkey will move south to destroy Damascus. Finally Turkey will lead the forces that are now fighting in Syria into the Golan Heights of Israel (Eze 38). I think that Jesus Christ will return at that time to fight against the Turkish led invaders in the Golan Heights (Nahum 1:3-8). Jesus will also take away Christians when he comes. The Rapture fuse is lit! The nearer that Turkey gets to Israel, the nearer that Jesus will get to Israel. By the way, today the Turkish Army is 300 miles away from the Golan Heights of Israel. Turkish President Erdogan is the Antichrist. 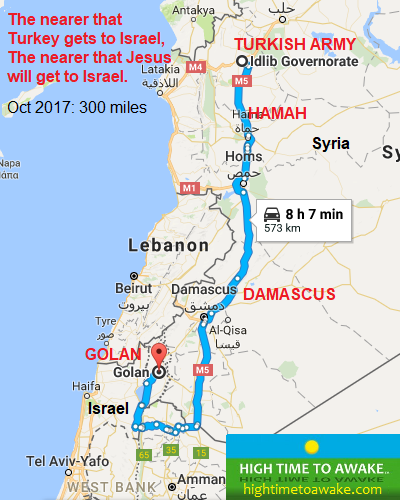 He will destroy Damascus and then invade the Golan Heights. Jesus will return to turn them back and to take his Church away. Afterwards I think that a peace deal will be made beginning the seven year Tribulation period. Half Lindsey covered Erdogan’s rise to power on his 11/8/17 report. Maybe the truth is starting to take hold. It was the first time that I noticed Lindsey devote any considerable attention to Erdogan. Thanks Brian. Lindsey covered a current news article about Erdogan. I hope that his eyes are opening. I have been following you now since 2014. You are right on cue with your current events. Will you be updating your timeline to reflect the current events? I really enjoy the commentaries, especially reading about Turkey as the main anti-Christ nation. In these times, I believe we are seeing a return of the Ottoman Empire only this time it is going to be global. Hi Deborah. Nice to hear from you. No I don’t think that the next world empire will be worldwide. Like every past world empire it will cover the old world. Roughly between northern Africa to India. I think that Daniel chapter 7 describes the European Union, a new Russian Union, and a new Middle-eastern Islamic Union as they combine to form the next world empire. Only just come across your site and finding it very interesting, need to look into it further. Can I add something you may or may not be aware of (if indeed it is of any significance). The centre of the Plains of Esdralon, also known as ARMAGEDDON (Megiddo is just to the west) where the armies of the north will congregate for the final battle, the co-ordinates are 35° 14′ E, EXACTLY NORTH of Temple Mount in Jerusalem 35° 14′ E. As I say whether or not this has any significance maybe you can give your opinion. Looking forward to reading more……. Hi Craig, Most time setters are now predicting that the rapture is on the 11 Sept 2018. My only time clock for the rapture is this map. it looks like we are very close as the Turkey army is much involved in Idlib. Thanks to you Craig.